Our exclusive Luxury Collections include 100 personalized note cards on triple thick stock plus 100 lined envelopes with return address. Arrives in a beautifully packaged box and makes a perfect gift. Viewing 24 of 58 items. 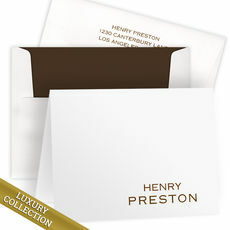 Luxury Preston Foldover Note Card Collection includes 100 foldover note cards personalized in raised ink with 100 printed and lined envelopes. Personalization will be printed in typestyle shown on.. 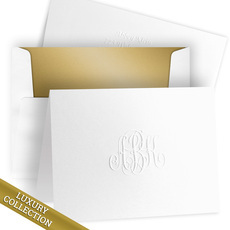 Luxury Embossed Mallory Flat Note Card Collection includes 100 flat note cards personalized in raised ink with 100 embossed and lined envelopes. Personalization will be printed in typestyle shown on.. Luxury Kristine Foldover Note Card Collection includes 100 foldover note cards personalized in raised ink with 100 printed and lined envelopes. Personalization will be printed in typestyle shown on.. 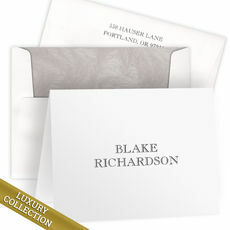 Luxury Portland Foldover Note Card Collection includes 100 foldover note cards personalized in raised ink with 100 printed and lined envelopes. Personalization will be printed in typestyle shown on.. 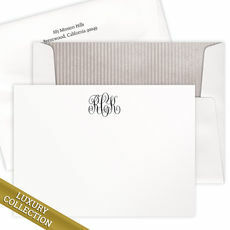 Luxury Embossed Script Monogram Foldover Note Card Collection includes 100 embossed foldover note cards with 100 embossed and lined envelopes. Personalization will be printed in typestyle shown on.. Luxury Tabitha Foldover Note Card Collection includes 100 foldover note cards personalized in raised ink with 100 printed and lined envelopes. Personalization will be printed in typestyle shown on.. Luxury Embossed Conrad Flat Note Card Collection includes 100 flat note cards personalized in raised ink with 100 embossed and lined envelopes. Personalization will be printed in typestyle shown on.. Luxury Embossed Malone Foldover Note Card Collection includes 100 embossed foldover note cards with 100 embossed and lined envelopes. Personalization will be printed in typestyle shown on sample. You.. 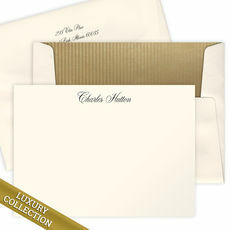 Luxury Embossed Masters Flat Note Card Collection includes 100 flat note cards personalized in raised ink with 100 embossed and lined envelopes. Personalization will be printed in typestyle shown on.. Luxury Embossed Sophie Foldover Note Card Collection includes 100 embossed foldover note cards with 100 embossed and lined envelopes. Personalization will be printed in typestyle shown on sample. You.. Luxury Milly Flat Note Card Collection includes 100 flat note cards personalized in raised ink with 100 printed and lined envelopes. Personalization will be printed in typestyle shown on sample. You.. Luxury Nelson Foldover Note Card Collection includes 100 foldover note cards personalized in raised ink with 100 printed and lined envelopes. Personalization will be printed in typestyle shown on.. Luxury Script Monogram Flat Note Card Collection includes 100 flat note cards personalized in raised ink with 100 printed and lined envelopes. Personalization will be printed in typestyle shown on.. 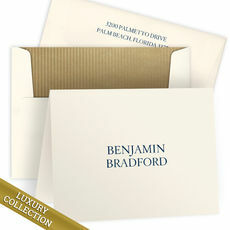 Luxury Dawson Foldover Note Card Collection includes 100 foldover note cards personalized in raised ink with 100 printed and lined envelopes. Personalization will be printed in typestyle shown on.. The Stationery Studio Luxury Collections are exclusively designed for elegant correspondence and gift-giving. Each set offers one hundred ways to show how much you care and provide an ideal way to communicate your extraordinary taste and unique sense of style. The sets feature flawless craftsmanship, attention to detail and impeccable style, which elegantly comes together in our quintessential collection of luxury note cards. We recommend these sets as a perfect gift for bridal and wedding stationery, birthday presents, anniversaries, and holiday gifts. The sets arrive beautifully packaged in a nice gift box.